Peanut butter, and the other nut butters. Basically a peanut is not a nut; a peanut is a legume. Nuts are things that grow on trees, and a peanut is a legume. So that’s why peanuts tend to be a little higher in carbs than do tree nuts. Which one is better for you than the other, I would say count the carbs, look at the carbs and peanut butter should be a little higher in carbs. The thing is, are you gonna eat all of the other nut butters, I don’t know. Peanut butter costs $2 a jar, almond butter costs $8. So you have to be pretty serious about wanting to eat a nut instead of a legume before you switch. 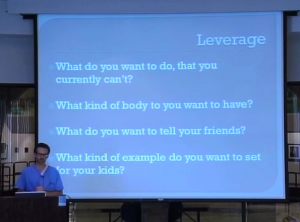 “What kind of example do I set for my kid?” That was a big thing with me. Do I want my kids to think that being tired and kind of lethargic and laying the couch all the time was normal, or did I want to set a better example for them? What is it that you want to do that you can’t currently do? 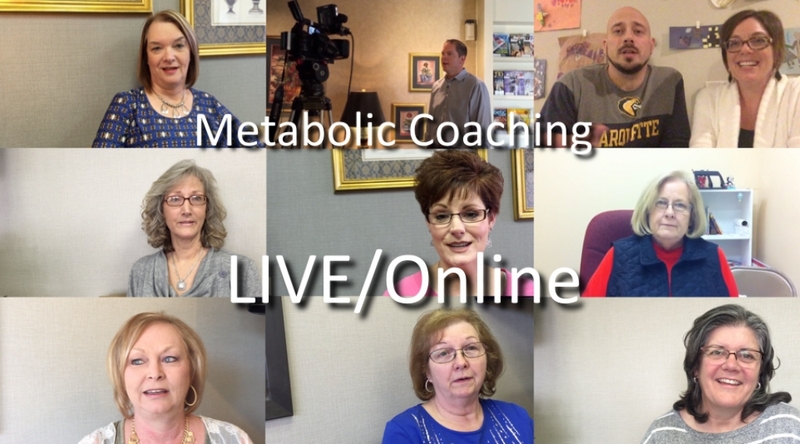 What would it be like if you could go to the office and tell people that you work with or your friends at church and just tell them, “Oh yeah, I just lost 40 pounds, it was easy.” They’d say, “What?” You can open your eyes. That’s what leverage is, it’s something positive. It’s what you’re working for, it’s what you’re working toward. And so if there’s any time that you ask yourself that question, “Do I wanna poison myself?” Just close your eyes and think for a second; think about what you want, not what you don’t want. Because you might say, “Well, I don’t want my stomach to hang over my belt,” or “I don’t want to…” whatever. “I don’t wanna have to go buy new pants that are bigger.” But that’s negative. You got to think about what you do want in your life. 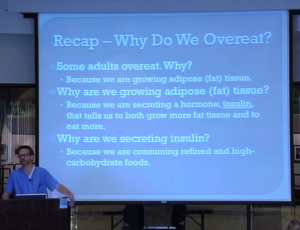 Why do we overeat? Remember, children are growing. Why do they grow? Because they’re releasing growth hormone. Why are they releasing growth hormone? Because it’s normal, a natural part of them developing. Now when we’re adults we don’t grow taller anymore. When we’re adults and we’re growing, we only grow out, that’s all we can do. So if adults overeat it’s because they are growing. And why are they growing? It’s because of the hormone, the hormone is called insulin. And why are adults releasing the hormone that makes them grow? It’s because of the carbohydrates in the diet. And this is that quote from earlier today: “In short, carbohydrate is driving insulin, is driving fat, ” George Kayhill, Harvard University. So that’s the thing, ’cause they’d say “The Atkins Diet’s a fad.” First of all, I showed you the stuff from 200 years – low carb is a 200-year-old concept. They have known that carbohydrates are uniquely fattening. Second of all, there’s these people all over the world that know “carbohydrate is driving the insulin, is driving the fat.” And now you know it, too. Now you should have no question in your mind, and if you do have a question, ask me. 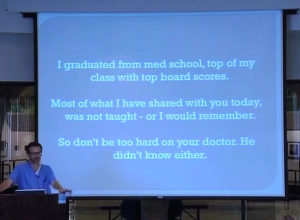 And the thing is, I graduated from medical school, I got top board scores, I was at the top of my class. I graduated in the top 5% of my medical school class. And I remember a lot of stuff from medical school. And the stuff that we talked about here today, they just didn’t teach. But don’t be too hard on your doctor because he doesn’t know, either. That’s one of the really big reasons that you need to see your doctor. Number one, if you’re on medications you’ll have to adjust them. Number two, he has to make sure it’s safe for you to eat a low carb diet because people with certain conditions can’t eat a low carb diet. And number three, you need to educate him. Do you think your doctor knows that you can eat a low carb diet with a lot of protein, a lot of fat, and dump 3/4 of your medications it two weeks and all of them in two months (that’s the example from My Big Fat Diet Canada)? If he knew that, wouldn’t he have told you that? When he diagnosed you, does your doctor know that if you cut the salt in your diet in half, you can drop your blood pressure 4 points? Or if you cut the carbohydrates, you can drop your blood pressure 20 points? If he knew that, wouldn’t he have told you that? And that’s what that sheet in the back of your handout – in the back of your handout is a sheet, it’s called the Metabolic Syndrome. 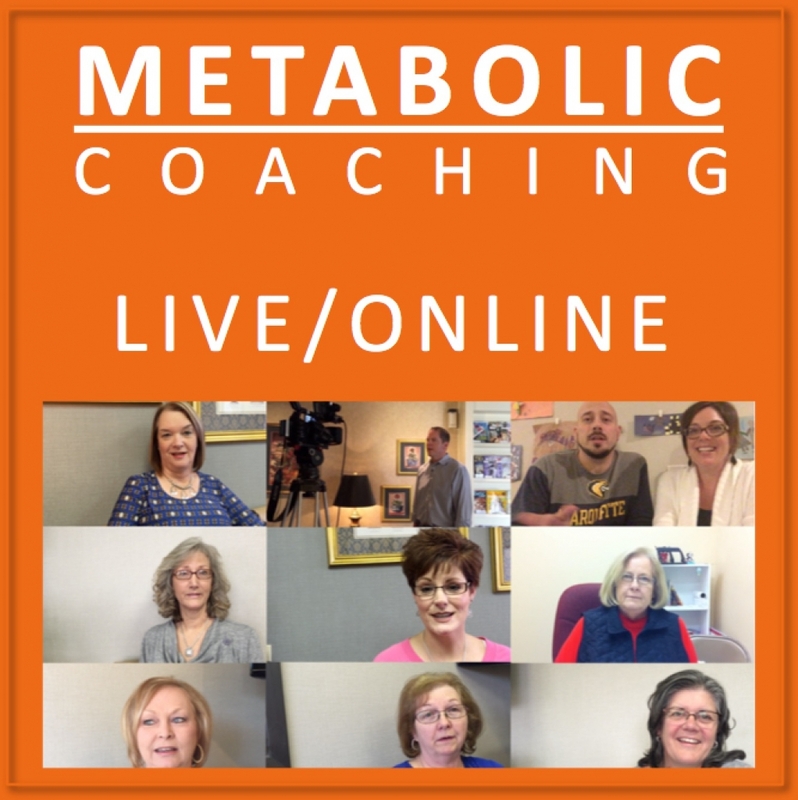 The metabolic syndrome, this is a whole association of diseases that go together – heart disease, high blood pressure, overweight and obesity, and all of the symptoms of those diseases. Not symptoms, but markers, clinical markers of those diseases such as your weight, your waist circumference, your HDL level, your triglycerides, your homocysteine. And you should carry that paper to your doctor.